of the many bizarre incidents here this week, i found the most humor in the story of chunk. 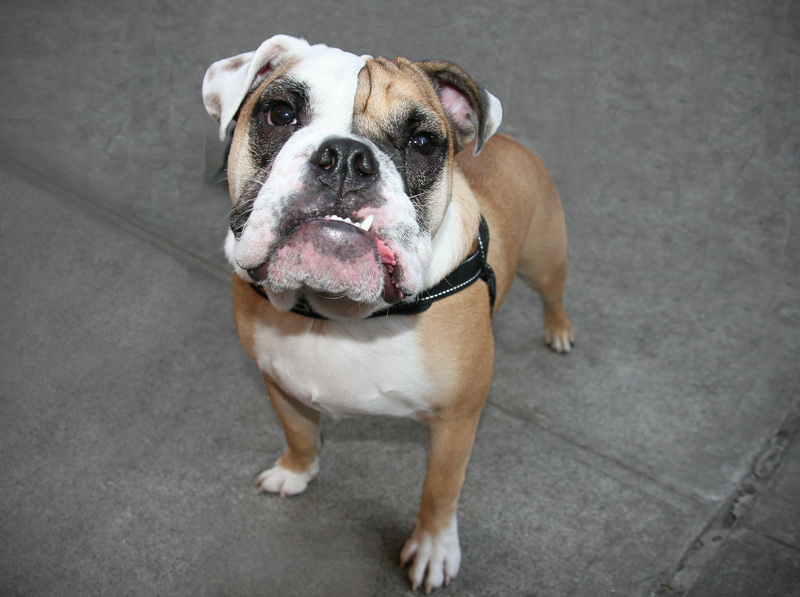 chunk is an 11 month old bulldog puppy who lives on the 4th floor with his exceptionally sweet & adorable owner, tom. i’ll start from the beginning which i will make up because i wasn’t there. chunk is comfortably sleeping in his over stuffed luxury chaise, dreaming of the moment tom will arrive home with some bacon. the rest of the story actually happened. when tom arrived home he was surprised that chunk wasn’t there to greet him at the door. he was even more surprised to see his coffee pot sparkling clean & glistening on his kitchen counter. he looked over at chunk’s empty bed and began to panic. tom spotted chunk under the desk in the corner of the room – shaking! tom quickly picked chunk up, held him tight & let him know everything was going to be ok. but it wasn’t ok – because chunk stunk of cheap perfume! there was only one place the intruder could still be hiding. tom tip toed into the kitchen with his bat and swung open the refrigerator door expecting to be ambushed by the crook but what he saw shocked him even more. the inside of tom’s refrigerator was sparkling clean! tom’s parents live in another apartment in our building and as strange as he recognized the thought to be, he thought that maybe his mother had come over and cleaned his apartment during the day. tom called his mother. understandably, she thought he had lost his mind. he then called his sister who lives nearby and asked her. also guessing her brother had gone insane, she assured tom that she had not gone over to his place in the middle of the day to clean. tom called downstairs to the lobby & told them there was a break in. the doorman informed tom about “the mistake”. the women went about their business – dusting, moving things & scrubbing away – until they got 1/2 way finished. they suddenly had an epiphany – ‘good lord, we’re in the wrong place!’ the two women left the kitchen sponge they had been using to clean the bathroom on the side of the tub next to tom’s clorox cleaner, went down to the lobby and exchanged tom’s keys for keys to the apartment on the 14th floor. tom then checked his apartment & didn’t think anything was taken but it’s entirely possible that poor chunk had been attacked in his own home by a cleaning woman with a fear of dogs and a bottle of jontue. poor chunk! This entry was posted in humor, ny city life and tagged 350 east 52nd street, free apartment cleaning!, intruders. Bookmark the permalink.